Technology and innovation are transforming the economy, and numerous reports warn that unless fundamental changes are made to ensure a steady pipeline of STEM qualified graduates, Australia’s workforce will be unable to meet future needs. The latest voice calling for urgent action on STEM issues is consulting firm PwC. 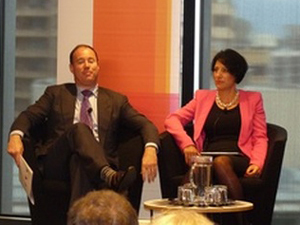 PwC’s report entitled A Smart move: Future-proofing Australia’s Workforcewas launched by Chief Executive Luke Sayers at a business lunch in Sydney on Thursday 30 April. With more than 40% of today’s jobs at risk of becoming automated, Mr Sayers argued that businesses of all sizes must help future-proof Australia’s workforce by radically rethinking their own operations and positioning. While around 75% of fast-growing occupations require STEM skills, only 16% of high school graduates pursue degrees in STEM disciplines. Mr Sayers warned that today’s STEM skills shortage will worsen if business and industry continue to ignore the digital disruption that is transforming the global economy and making many of today’s jobs redundant. The top three occupations most at risk are accountants, cashiers and administration workers. That PwC’s core business, accounting is among the highest risk of automation over the next 20 years was a shock even to Mr Sayers who said that the company has been planning for this change for a while. Three panellists then joined Mr Sayers and Sydney Morning Herald science editor Nicky Phillips for a discussion following the report’s launch. Liberal MP Wyatt Roy called for more risk-taking and said we need to encourage young people to become entrepreneurs right here in Australia instead of pursuing opportunities overseas. He also suggested that pigeon-holing careers is both unhelpful and uninspiring. “Instead of asking kids what they want to be, we should ask them what problems they wish to solve,” Mr Roy said. Rather than seeing STEM disciplines as stand-alone silos, IBM’s Catherine Caruana-McManus argued that arts, culture and creativity have a role to play in order to get young people excited about problem solving. “How are we going to communicate the jobs of the future in a way that sparks excitement?” Ms Caruana-McManus asked, adding that business needs to be more closely involved in STEM research to ensure that more of it leads to jobs growth. The report predicts that by growing its STEM workforce by just one per cent, Australia could potentially deliver a significant boost to the economy worth $57.4 billion – but only if we begin to develop the STEM workforce in line with other comparable countries. All panellists agreed that Australia’s economy will suffer unless there’s a radical shift by business to boost the STEM workforce and enable more innovation from research. Mr Sayers also urged businesses to actively hire more STEM graduates who will move up into leadership roles. “We need to look beyond the traditional pool of recruits with qualifications in law and accounting,” he remarked. working with policy makers to up-skill the workforce of the future. Mr Sayers said that PwC will soon unveil a national strategy designed to generate more STEM graduates for business.